Novi Sad is about 70 km north of Belgrade, and is home to many industries, one of which is Karan Acoustics. This is a company named after its founder and chief designer, Mr Milan Karan, an engineer with extensive experience in the professional audio and video sector, who spent years working on national TV. His passion, however, was and is audio, so with a life-long friend, he established the Karan Acoustics company and started manufacturing fine audio products. What makes him so different from most other designers are three things. First, he believes in listening above all and comparing whatever he makes with the only truth in musical life, and that's live music; whenever he has the time, he'll be found on some live music event rather than staring at the TV or DVD. Second, he has very particular views on circuit topology, and is locally well known for sketching his circuits for fellow engineers, who tell him that those circuits are impossible and will not work, after which he informs them that they are listening to the impossible as they speak. And third, he has very, but that's VERY uncommon views on reliability, build quality and testing; he does things to his products that I seriously doubt 99% of the High End products could ever survive. He says it's not which technology one uses, it's how one uses it that will or will not yield results. Thus we have "high end" components which don't really sound like much at all, and "low end" components which sound much better than one would expect from their price. By way of example, the unit tested here was released after it was tested, and the testing was to make it clip 40% of the time and let it go like that for 48 hours on end (sic!). Clipping is the most severe form of distortion of all, as it stresses the amplifier like nothing else, and does so all around, both in terms of audio circuits, power supply and especially the output stage. If for any reason it doesn't make it, it never leaves the works. To the best of my knowledge, nobody does it quite like that, nobody. But other than this, Mr Karan is about 2 meters tall, enjoys good food and is one of the most jovial people I ever met. The front panel has just two knobs - a source selector and a volume pot. The selection made is indicated by a blue LED. The power on switch is on the back, which is also occupied by WBT speaker binding posts and some top quality, heavy duty, gold plated, teflon insulated RCA cinch plugs for four line inputs and a tape output feed. The fifth line input uses XLR balanced connection, for say a CD player which has such outputs. Inside, the actual switching is performed by vacuum relays. The speaker protection relays are German made Schrack units, rated at 8 Amperes. The center is occupied by a custom made, low loss 600VA toroidal transformer, which has a common primary for both channels, but separate secondaries for each channel. Rectification is by 1N5406 discrete diodes, these being fast rectifier diodes, each rated at 3A; by the look of all 32 of them, I'd say that each channel has diodes placed in parallel, plus positive and negative sides totally independent for each channel. This is a must for greatly increasing amplifier stability under stress and to avoid current starvation. After the diodes, there are two 10,000uF/63V filter capacitors in parallel for each supply line, for a total of 80,000uF. Additional filtering is by a Germany company Roe (Roederstein). Wima caps are in evidence all over the board. Initial line level amplification is performed by integrated circuit op amps by Burr- Brown, and the power amps also use some sort of hybrid circuitry, mixing op amps and high quality bipolar devices. The driver transistors are 2SC2168/2SA958, and the output devices are 2SC3858/2SA1494, all by Sanken; the output devices are RET types (Ring Emitter Transistor, which is actually composed of several smaller devices rather than a single large one, as this improves frequency response and rise times). Hybrid circuits, mixing op amps by Burr-Brown and Analog Devices and discrete transistors are used throughout. Small caps are mostly by WIMA, and all small power resistors are 1% metal film types. Emitter resistors are MPC types by Motorola, which use metal film rather than wire or carbon; they are therefore non-inductive, again improving stability, especially in the critical high range region. Internal wiring is by van den Hul. The amp is said to work in a fully balanced configuration internally, and uses floating ground; hence, stability is considerably improved, as are S/N ratios. The case is constructed from aluminum. The front panel is all of 20mm (0.8 inches) thick. The back panel and bottom plates are "only" 10 mm (0.4 inches); compare that with the usual in the economy class, where you're happy to get 1.2 mm thick sheet metal. The top plate is the poor relative, being only 5 mm (0.19 inches) thick. The side panels are heat sinks, I'd say German made Fischer SK 56 (75 mm tall, 300 mm wide, 0.46K/W), are very efficient - and expensive. Then again, for this kind of power, they have to be efficient. The amp is rated at 180/300W into 8/4 Ohms, 20...20,000 Hz, with no more than 0.03% distortion. Its response is DC...300,000 Hz -3 dB, the damping factor is quoted at better than 1,800 (65 dB) 20Hz-20kHz (no output inductors! ), and the S/N ratio is said to be better than > -112 dB. Dimensions are given as 500x90x390 mm (19.7x3.6x15.4 inches) WxHxD, including all protrusions, front and back. Mass is 16 kg (37 lbs) net. All that's very nice, but how does it play music? What does it sound like? Well, actually, it doesn't sound like anything. It's not there. Physically, you could hardly miss its size and weight, but musically, it does the greatest trick of them all - it disappears. There's just you and your music, no amp in between. It's an uncanny effect, almost scary. I use a modest CD player for evaluation, a Harman/Kardon HD730, modified only by having its original feet replaced by SoundCare spikes, but I daresay I never realized what was available from that CD player at such low volume levels. For example, I always thought bass weight was mostly a matter of volume and our psychoacoustic deficiencies in hearing, but this unit made me think again. If it can do this at low levels, and without overblowing anything, with full preservation of the overall tonal picture, then it does things no other unit I ever came across before could. Vivaldi's "Four Seasons" were just as convincing as Billy Idol's sheer electric power, and Led Zeppelin was just short of being there - quite unnerving, given that this was a recording made almost 30 years ago. "Carmina burana" was a joy to listen to, and I had it going at really low levels, marveling at the amount of detail, at the almost surreal physical quality of the music. If it could do things like that at low level, I wondered what it would do at normal and above normal levels. So I tried. I shouldn't have. I loved it at low levels, but at normal and above, I just don't see myself returning it - ever. I'll have to, of course, at this time I simply cannot afford it, but I sincerely believe it'll be for a short time only. At normal levels, the music, whatever you choose to play, attains such presence you start believeing you could touch it, as if it were a real, physical thing. It's not physical of course, but real? You better believe it! I'm going to stop now, or else I'll start waxing lyrical about it - I've turned junkie. Please remember that all this is subjective. What follows are my own notes sorted out for your benefit. Over the years, during say the last five, I've had all sorts of units passing through my home, including Krell, Levinson, Kensonic, but to my great regret, no Spectral. So, I know what's on offer and at which prices. Very simply put, none, that's NONE of the above could run shoulder to shoulder with this one. This is bold statement, I know, but pause and think. Audio, and especially high end audio, is a big business, where billions of dollars change hands every year. All big names started from garages and similar premises at one time or another, but to the best of my knowledge, most of them also came to a point where they forgot all about sound and concentrated on marketing ever more products, and increasing their production facilities. Also to the best of my knowledge, just as many went bankrupt and were bought out by mega corporations, who bought them for their name. What would such mega corporations do with such famous names, do you think, keep them small, or make them grow, so more money is made? In other words, if you want real sound, you will most probably have to look to small, specialist companies, who live at the edges of the audio world. They are small and have to try hard just to survive, and they can't match the big guns on price alone, so they opt for an audiophile approach. A few make it, most don't. Karan Acoustics is exactly such a company. They're not saying how their circuits work, but it's obvious they have some tricks up their sleeve, that plus the fact that they threw price considerations out of the window and used top quality materials only. They also used just about every book on how audio should be done too, as I could see on the evidence of how the unit was put together - by the book, chapter and verse. So how come they offer big gun quality at pistol prices, you ask? Simple - a work hour in Yugoslavia costs 1/7 (yes, that's one seventh) of what it costs in say Germany, or about 1/10 of what it costs in the US. They could afford to go by the book, no exceptions. When you put in custom made toroidal transformers, when you use a true balanced approach (not quasi- balanced as most of the industry does) and top quality materials, and bind it together with obviously considerable knowledge among the design team, you're bound to come up with some rather good results. To be excellent, you have to be a crazy audiophile, which they all are, appearently. It doesn't sound like transistors, or like tubes, or like MOSFET, or like IGBT - it doesn't sound at all. You can't categorize it, as it skillfully combines the virtues of all those technologies, but somehow manages to avoid all their faults. It has the warmth and ambience of tubes, but offers much better detail and incomparable speaker control no tube amp can ever do. It has the detail, the focus of solid state, but with none of the harshness and sometimes edgy treble of solid state. It sounds almost like MOSFETs, but can produce such current as very few MOSFET amps could ever hope to produce, even using latest Toshiba devices with much improved current capabilities (up from Hitachi's poor 7A to 12A). Exactly how they do it, I really don't know, but who cares? So I'm testing a product with no vice. Over the years of testing things technical, I have learned not to trust myself first, and then everybody else. 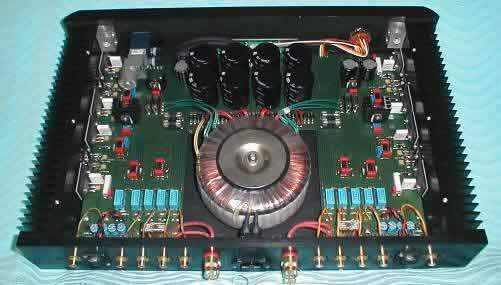 To this day, I believed Electrocompaniet's now disconitnued ECI-1 integrated amp (2x100W/8 Ohms, app. $ 4,000) was the best I had ever heard in integrateds, much better than say Krell, so I decided to check up on myself. I borrowed a sample and compared it with the KA-I1, and found that the ECI-1 was no match for the Karan product; still a great unit, but simply bettered, period. Then I decided to hog it and go all the way - so I borrowed what is probably the best DAC on the planet, the dCS Elgar. Yes, I did connect the coax output of my humble HD730 with the dCS, but all I got for it was to make myself sicker still. There was detail before, but the Elgar just showed up so much more of it, and I could hear it all via my AR94 speakers, right in my room. No special showroom, no particular acoustics, none of that, just my everyday room. But this proved the point once and for all - the KA-I1 is the best integrated amplification I ever had in my room, playing with my system. It was great with my strictly economy class system, and it showed better yet results with upgrades, so I can only imagine what it would work like with an all-around better basic system. I have heard better, but only from separates, costing from ten times (!!!) its price upwards. Now, surely that's no reasonable comparison. A truly stunning product, and I've waited 16 years to say that. The best integrated I ever heard so far - Krell, Levinson and Kensonic included. Where others impress, this one manages to disappear, becoming the nearest thing I know of to the old holy grail of audio - a straight wire with a gain. You have to get used to this effect, it's that unusual, but once you do, beware, you will have been poisoned forever. Not many will ever be good enough again (though I wouldn't exactly object to Electrocompaniet's ECI-1, nonetheless). Due to the last 10 years of UN sanctions and the NATO war in 1999, this product is currently available only via Internet. A dealer system is being negotiated, but it will be slow work. However, you can enquire with vox@eunet.yu . As for the incredible price, I was told it is an introductory offer and would hold good for the first 20 units sold, after which it will go up to its "normal level", expected to be about $2,000. Also, the pictures you see are for the first five samples only, while the rest will have a much nicer facia, with portrusions and a middle of the box display. It will illuminate in red upon switching on and instead of the row of blue LEDs on the bottom of the facia, a red indicator will illuminate to show your selection of inputs. All this will not influence the price. Finally, Mr Karan will not allow any dealer or otherwise to hold a stock, at least not officially. He says stocks are bad as they keep units just sitting there, and their components slowly but inevitably start to change their operating characteristics. Therefore, each unit is made to direct order, by one man who signs his own handiwork and each unit is tested by Mr Karan himself, who will then sign its data sheet. One of the tests includes making the unit work for 48 hours with 40% clipping time - if it survives this killer test, you may have it, but then, you don't need to work it out upon unpacking it. Just sit back and drown in music.